It’s cold and rainy today, and that means no work in the garden. These kinds of days are great for transplanting, but it’s too early to put seedlings out, and the lavenders I am planning to move from the herb garden to the big garden are still buried under snow. Instead, I am working on finishing the Ultimate Travel Bag. Making these cuts was nerve-wracking. This is the point where, if you screw up, you have to go back to the beginning. No mercy. They were recommended in the video and even though they were on the pricey side, I am glad I bought them. I was able to make perfectly rounded corners. They will find a use in other projects, no doubt. Wonder Clips have to be one of the best things ever invented. Pins, while great for garment sewing and quilt piecing, have a tendency to become deadly weapons in thick layers. Wonder Clips do not cause me to bleed all over my projects. I sewed the front to the gusset on the Necchi industrial and then attached the binding. The Necchi handled it without complaint. 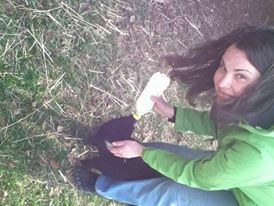 I should have noted at the beginning of this project that I am not using Annie’s Soft and Stable. I have some, but the pieces I have were too small for making the quilt sandwiches. Rather than buy more—because I am trying to use up stash supplies—I decided to dig into my supply of Pellon Flex Foam. Flex Foam is similar to Soft and Stable, but it’s different enough that if I were to sew this bag again,* I would make sure to use the Soft and Stable. For one thing, the Flex Foam is stiffer. Annie kept saying throughout the video that the Soft and Stable compresses when you sew it. The Flex Foam compresses, but not to the same degree, apparently, that the Soft and Stable does. That difference in compressibility is why I think the Janome had trouble with three layers of foam. I think the Flex Foam is also a tad bit thicker, although I didn’t get out the calipers to make a formal comparison. I would also devote some brainpower to figuring out how to keep the foam out of the seam allowances. 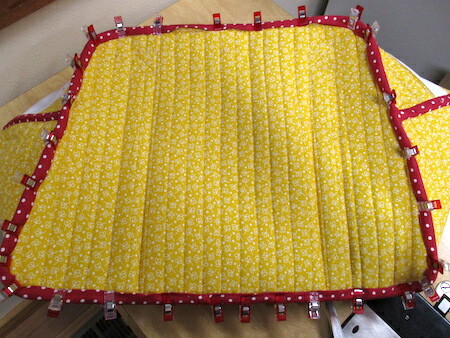 The allover quilting of the exterior, foam, and lining makes trimming the foam from the seam allowances somewhat problematic, but there should be a way to remove some of the bulk. I had a boatload of trouble sewing the ends of the binding together to make a smooth join. I almost can do it blindfolded on quilts, but Annie has a different method and one that just didn’t make sense to my brain. I tried it her way three times, then finally gave up and did it the way I do it on quilt bindings. Bam. The binding is ready to be sewn down. I am sewing mine down by hand, both because I prefer the way it looks and because I don’t feel like wrestling the bag through the Necchi again. When this side of the bag is done, I’ll sew the back of the bag to the gusset, attach the binding on that side and sew it down, and then the bag will be done and ready to use. Overall, this was an enjoyable project. The instructions and video were excellent. Annie has several other styles of travel bags and one of those might be a good future project. 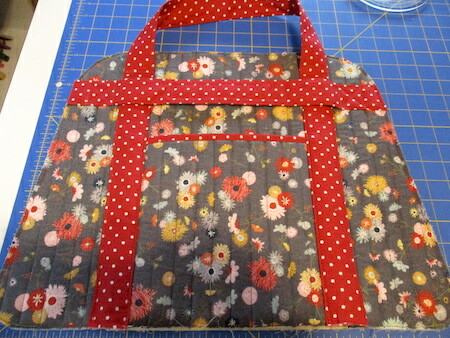 Next up, though, is the Noodlehead Redwood Tote, as soon as I get my hands on some zippers. *In case anyone is wondering, I would be happy to make you one of these. The cost will be $750. The materials alone can run upwards of $150, and there are very few people in the world I love enough to spend the hours and effort required to make a bag like this as a gift. Just so you know. The next couple of days will be devoted to auction activities, so don’t expect to see much here on the blog. My job at the auction is to be in charge of the cashiers and sit at the customer service window to answer questions and resolve disputes. Most people who come to our auction are understanding about the fact that it’s a nonprofit fundraiser. We do get the occasional hard-liners who want to lecture us about the way proper auction houses run things, but hey—we do this once a year and it’s an all-volunteer event. I smile a lot and say, “Thank you for your understanding and support.” If you come to the auction, make sure you stop by and say hello.